I took off to Haarlem with a blank mind, not thinking about what to expect. With some bands you know upfront what you are going to see, with Anathema I was not sure. They started out as a doom metal band many years ago, playing with bands like Bolt Thrower, Paradise Lost and Cannibal Corpse. That music compared to the album Hindsight I reviewed about a year ago, which is mostly acoustic and very mellow, provides a very broad spectrum to choose from. First the stage was set for Leafblade, an acoustic project consisting of Sean Jude and Daniel Cavanagh, guitar player for Anathema. 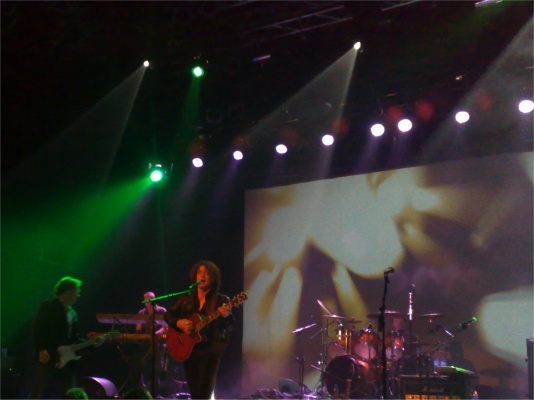 On some songs they were joined by Anathema bass player Jamie Cavanagh and several people on percussion. The music was very relaxed and I really liked it, Sean had a very pleasant voice and all fitted very well. Some people are always talking when the support act is playing, if you buy a ticket for the main act you just do not know if the support act is going to be your cup of tea. With the set being acoustic this was more disturbing than with a plugged act. All considering it was a more than descent performance, especially the Led Zeppelin cover Going To California received cheers. Anathema came up with the stage covered in smoke. Ever since the no smoking law the bands need to produce these clouds themselves. A bit in the back were Les Smith on keyboards and John Douglas behind his drums. The front of the stage was for the Cavanagh brothers, Daniel and Jamie for the second time and Jamie's twin brother Vincent for the first time. The last one sure entered in a furious way, demanding some action and excitement from the crowd. He started singing very aggressively, almost spitting at the microphone. It was not doom metal what they played and it also was not the mellow music from Hindsight. A very varied setlist with songs from almost every album, this resulted in a mix of progressive rock songs, some mellow acoustic songs and some songs were really heavy. 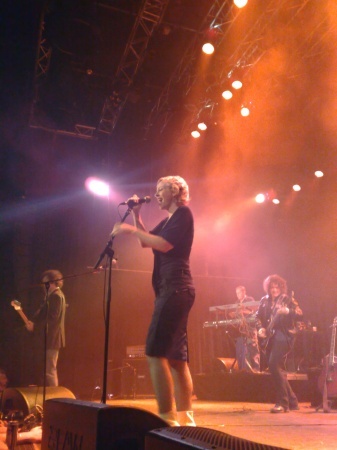 The last studio album A Natural Disaster appeared to be the largest supplier, A Fine day To Exit provided only one song. I am not very familiar with the complete back catalogue from Anathema, from the reaction from the crowd apparently some songs were favourites from older albums. They were not known to me but I liked what I heard. Patronaat was not sold out but it was nicely crowded, enough action to fill the floor. Also worth mentioning is the fact that I did not have to use earplugs, the sound was good and loud enough but not too much for my hearing. 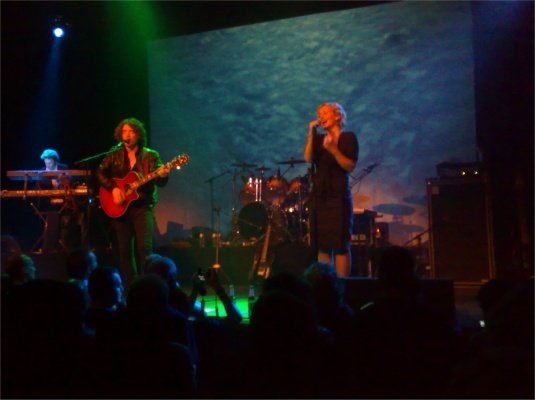 Special guest for this evening was Anneke van Giersbergen. First appearance was with A Natural Disaster and she came back for the Damien Rice cover Blower's Daughter, also present on the latest Agua de Annique album. She also did the female vocals for Parisienne Moonlight, on the album done by Lee Douglas. Sometimes the difference between the songs was very big. Blower's Daughter was very mellow and some of the old stuff was really heavy. During one song a snare on Vincent's acoustic guitar broke so he had to use his electric guitar in the next song instead of the acoustic one. I for sure did not mind that, I like the diversity of the band but my taste is more for the heavy stuff. Thankfully there was enough of that. Best news of the evening was that, besides many new albums from side projects, the new Anathema album is coming. The band has done their bit and the recordings are being mixed. From the new album, the working title for the new album is Horizons, they played two songs, Angels Walk Among Us and Oceans.